Subway (travel time 5 minutes) → JR Hakata Station → "Huis Ten Bosch" limited express train (travel time 1 hour 40 minutes) → JR Huis Ten Bosch Station. Sasebo bound via Huis Ten Bosch limited express bus (travel time 60 minutes) → Huis Ten Bosch. Take the "Huis Ten Bosch" limited express train to JR Huis Ten Bosch Station (travel time 1 hour 40 minutes). Take the "Seaside Liner" express train on the JR Nagasaki/Omura Lines to Huis Ten Bosch Station (travel time 1 hour 30 minutes). 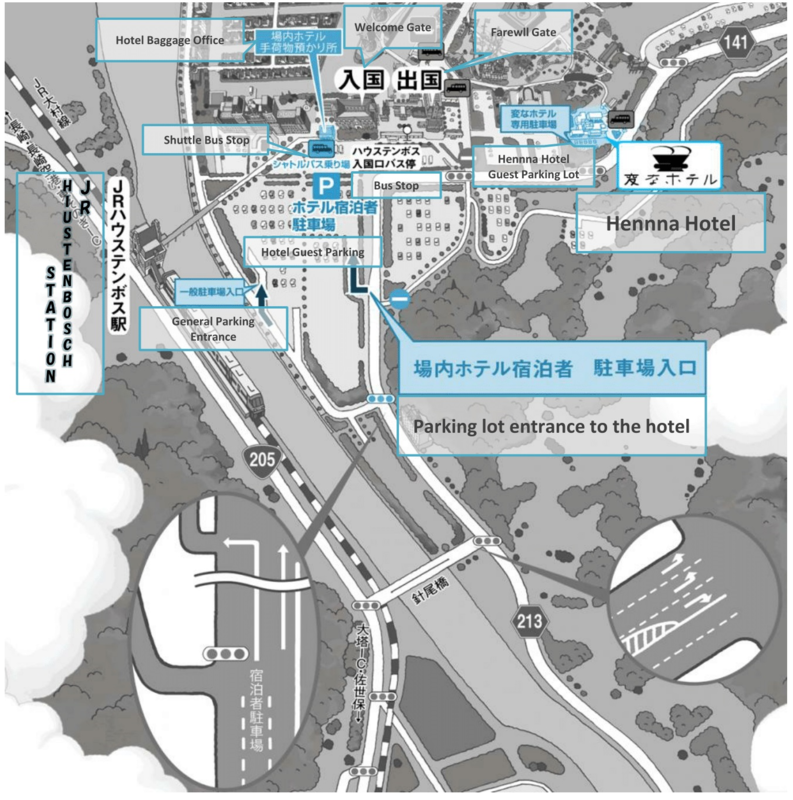 Take the rapid or local train on the Omura Line to Huis Ten Bosch Station (travel time between 20 to 35 minutes). There are several ways to get to the hotel. Choose the access that fits your plan. We offer free parking for guests for the duration of their stay. Please bring the parking ticket to the front desk for validation. If the hotel parking is full, guests may be asked to park in pay parking lots. In that case, please be sure to take the receipt and bring it to the front desk for refund. This is subject to change due to special events, etc. Cross the large bridge after exiting Huis Ten Bosch Station and proceed in a straight direction. Shuttle bus service is available between hotel reception house and hotels. After disembarking at the Huis Ten Bosch bus station, proceed to the right.